Does your career need therapy? If so, then join the TEAM! 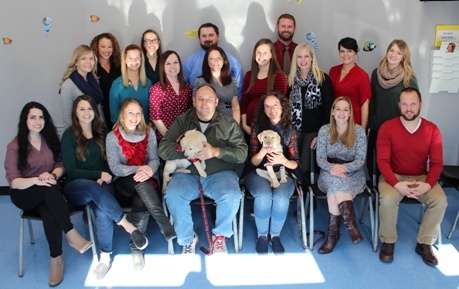 TEAM 4 Kids provides a fun, rewarding environment in a pediatric setting for therapists with an emphasis on learning through movement and play. Caseloads are therapist driven based on each therapist’s passion within their profession and are highlighted with groups, classes, and multi-discipline co-treats. All of our individual treatment rooms have swings to promote movement. Our current TEAM Members love working here and you will too! “Your” admin TEAM is dedicated to making a therapist’s job fun! Our therapists never have to set up their own schedule or get involved with billing. Streamlined paperwork- spend your time with children, not on paperwork! Thank you for taking an interest in our opportunity. Whether you are seeking part-time, full-time, a clinic or home based caseload, we have an option for you. If you have any questions, please feel free to call 623-322-8250 or email me @ otlisa@team4kids.com. I look forward to discussing our opportunity with you.